First final and first game fireworks in North America: Padres 3, Dodgers 1. Standings: San Diego 1-0, Los Angeles 2-1. Winning pitcher: Dale Thayer (1-0). Losing pitcher: Brian Wilson (0-1). 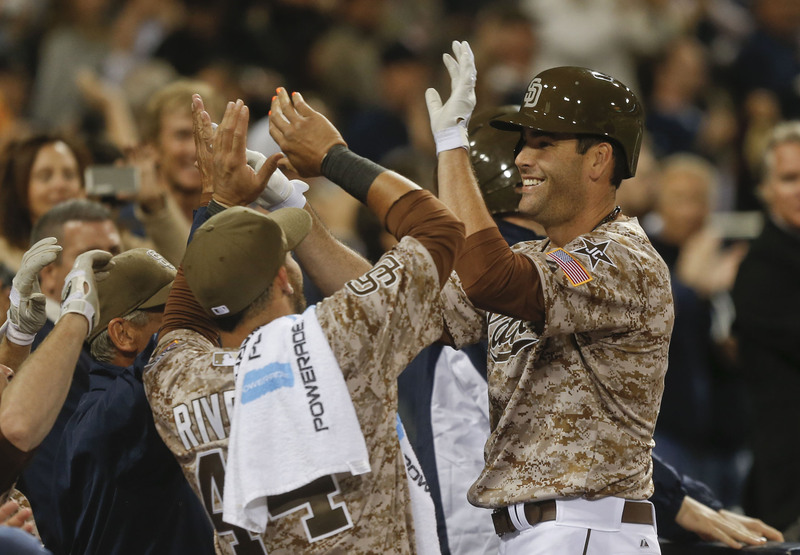 Star: Seth Smith (above), solo homer in his first Padre AB tying the score and setting up Chris Denorfio’s decisive two-run single. 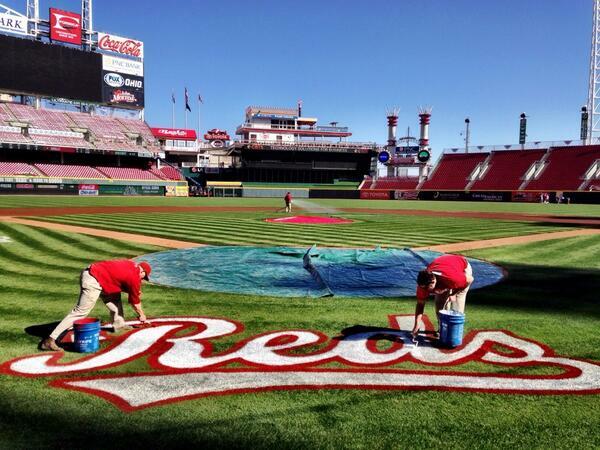 Next up: 13 Opening Day matchups on Monday, all streamed live out-of-market on MLB.TV. First time Dodgers trail in 2014: Then it gets worse for Wilson in every way, as he lacks command and composure and gives up a two-run single to Denorfia (below), making it 3-1, San Diego. First Padre run of 2014: Seth Smith’s first at-bat as a Padre, and BOOM. Brian Wilson leaves a 2-2 slider over the plate and Smith mashes it deep into the seats in right, tying the score. Fans on MLB.com #GoYard immediately, entering for a chance to win a backyard makeover from Scotts. No 2-0 start for Ryu. Now is a good time to make sure you have an MLB.TV Premium subscription. All 13 games openers on Monday will be streamed live out-of-market by the Internet’s longest-running and No. 1 sports streaming service. What are you looking forward to the most? How about Jose Fernandez’s season debut in Miami after his amazing rookie campaign? Cashner struck out five and allowed four hits through six. Ryu still going strong in bottom of seventh, in line to go 2-0 before any other MLB club wins a game. First “God Bless America” rendition of the season: Jessica Sanchez from “American Idol” Season 11, a local resident. Followed by “Take Me Out To The Ball Game.” Seventh-inning stretch. First run in North America: Crawford singles to left with two out in the top of the fifth after striking out his first two times up against Cashner, driving in A.J. Ellis to put the first score on the Petco Park scoreboard. The Dodgers have scored first as a road team in each of their first three games this season. “In most other parks it’s a home run. But here in San Diego, it’s just a long fly ball.” — Dodgers radio play-by-play man Charlie Steiner on MLB.com Gameday Audio, describing Chris Denorfia catching Adrian Gonzalez’s fly against the wall in right, keeping the game scoreless in the fourth. Don Mattingly just told ESPN that his Dodgers have to beat Cashner in the middle of the plate, because “he’s too good to beat him on the edges” right now. How stunning does Petco Park look tonight? We rightly made a lot of fuss over the Sydney Cricket Ground transformation, so maybe the bar began a bit high, but we think Padres radio play-by-play man Ted Leitner was right when he just said on MLB.com Gameday Audio: “Wow-ee, this place look beee-yooo-tiful!” Great job by grounds crew. First looks around MLB.com? Here’s our guide to the season with the tech leaders in sports. Just heard on ESPN: John Kruk loves the Cardinals’ bullpen. You can tell Cardinals fans are watching, because Kruk is Trending on Twitter. Everyone’s watching, as it’s the only game for just a while. First Dodger hit in North America: Juan Uribe singles through right side after Cashner retired the first five in a row. 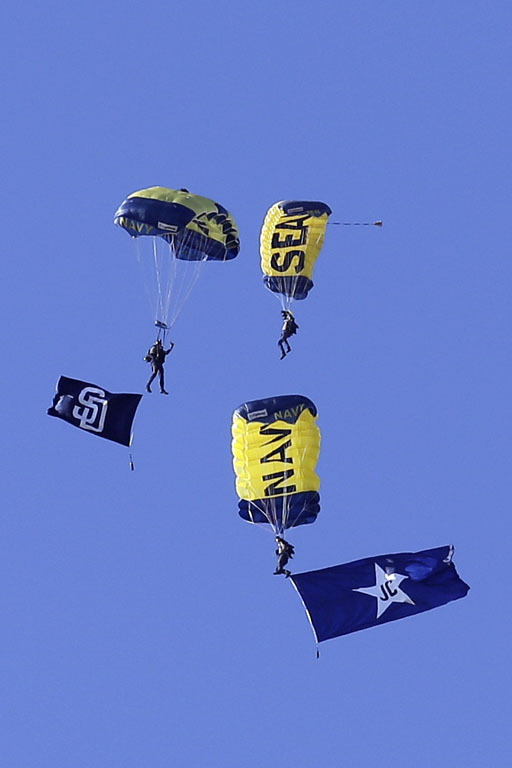 Navy SEAL Leapfrogs parachute over Petco Park with a flag in honor of former Padres announcer Jerry Coleman. “Jerry, it’s never going to be the same,” Padres radio play-by-play man Ted Leitner says during San Diego’s first-inning rally, speaking about his longtime former mate in the booth. First Padres baserunner: Everth Cabrera leadoff walk in the first. First “Beat L.A.” chant. First bases-loaded escape for Ryu, who gets Yonder Alonzo to ground into the ol’ 1-2-3 double play. 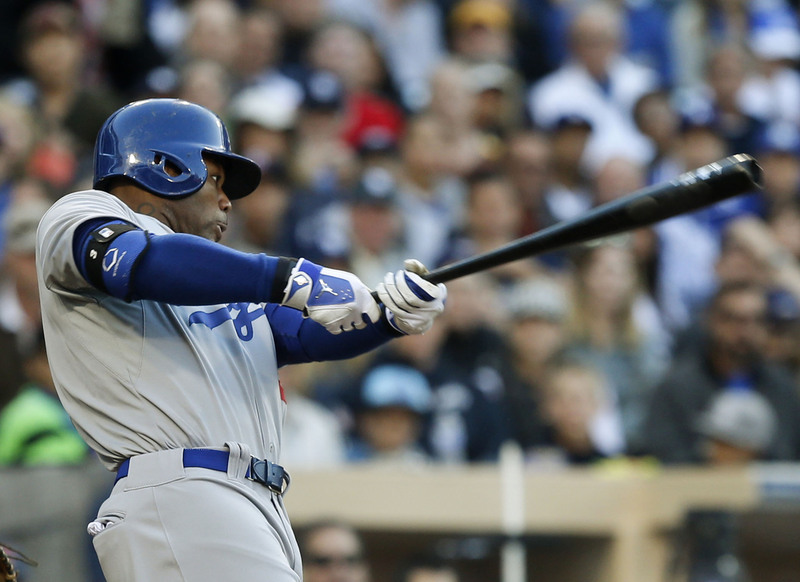 “You don’t get a playoff atmosphere by just Opening Day, or just a game against the Dodgers. 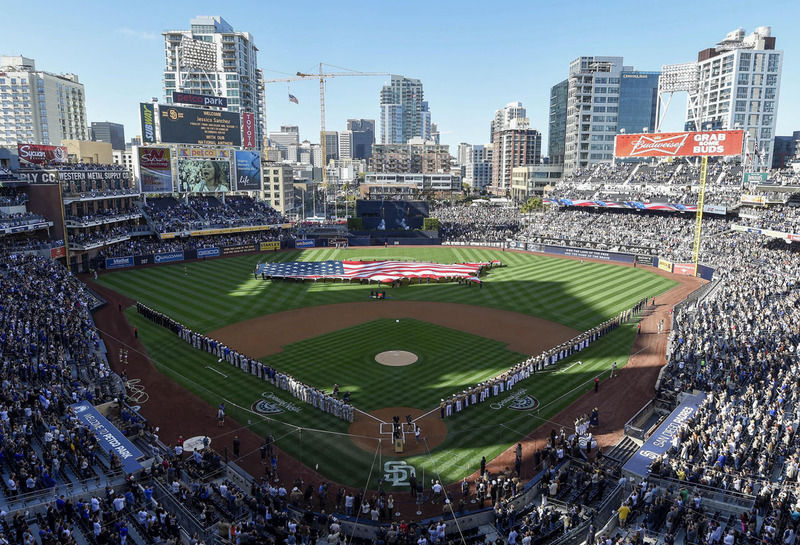 Combine Opening Day and the Dodgers and you get a playoff atmosphere,” says Padres radio play-by-play man Ted Leitner on MLB.com Gameday Audio. First pitch: Andrew Cashner to Carl Crawford, 8:13 p.m. ET, 94-mph fastball outside for a ball. First strikeout, high heat and unsuccessful attempt to check swing. Second strikeout, three pitches to Yasiel Puig. Dodgers go down 1-2-3 on Hanley 9. First time on DL in Clayton Kershaw’s career. Hyun-Jin Ryu starts for Dodgers — uniquely starting a second consecutive game for a club, having won the decision in Game 2 at Australia. First ESPN Sunday Night Baseball action of 2014, first MLB regular season game in North America. 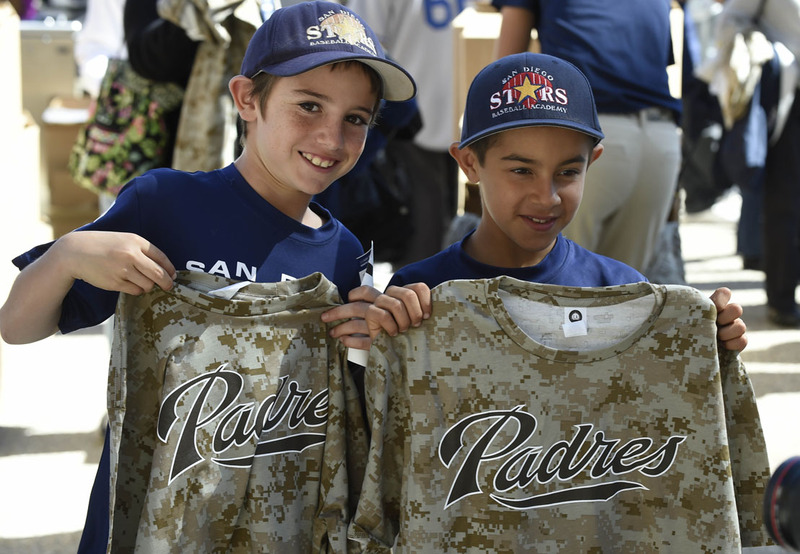 First camo jerseys: San Diego is a Navy town, and the Padres salute the military with camo each Sunday. Click here to order your own at the MLB.com Shop now. First “Star Spangled Banner” in North America: Jessica Sanchez from “American Idol” Season 11, local resident. Click here to watch. Nice tribute by the Padres to the late Jerry Coleman, the Hall of Fame broadcaster and former All-Star and war veteran who spent 42 years in the Padres radio booth, with the exception of one year when he left to manage the team. 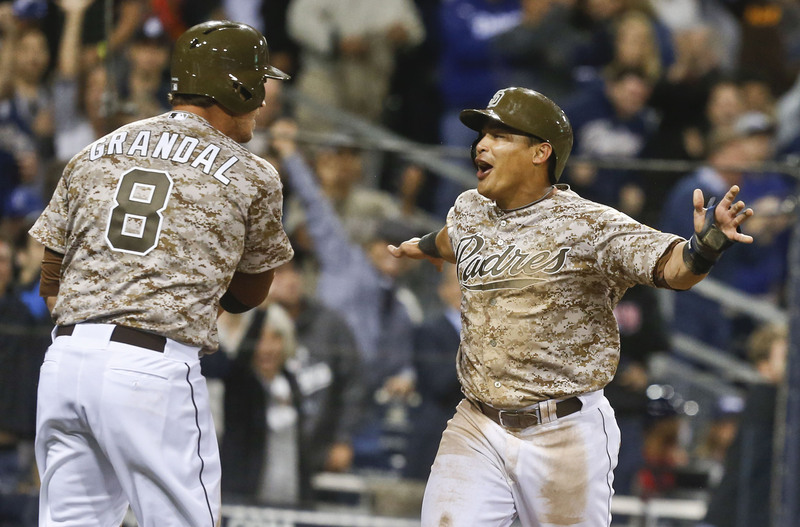 Padres players have a gold star on their left sleeve, with “JC” in the middle. A great game. Yup, today should be a holiday. Opening Day, here we come!